B’s latest work adventure took him all the way to Manchester, England. I thought it was most appropriate, as it presented the perfect opportunity for him to revisit the country he once called home for 3 years when studying in Coventry. 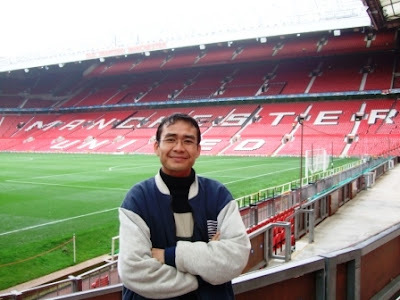 His mission this time, was to do some coverage on My Team's visit to Manchester. My Team by the way is a reality show on TV 3, which aims to revive football in Malaysia whilst uncovering new talents in this sport. This was no ordinary trip mind you; it was a dream come true for football fans, especially if you’re a Manchester United supporter. Aside from B and a handful of others, the entire group comprised hard-core MU fans, who couldn't wait to get down to the trip’s agenda, which included a visit to Old Trafford and MU dressing room, meeting some of the most renowned names in football as well as watching a live match between MU and Roma at Old Trafford! Although it began as an MU affair in every way for B, the trip turned out to be a wonderful experience for him. 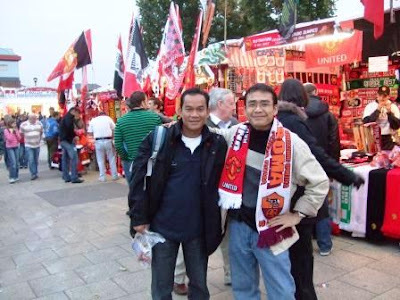 By the end of his one-week visit, the Liverpool-fan B grudgingly admitted that he had a whale of a time in Manchester. Besides indulging himself in an uninterrupted week of his favourite sport, he also enjoyed a wonderful football shopping spree and even managed to make a short trip to Liverpool, which was a mere 55 minutes away by train. So while we were looking through his Manchester pictures last night, B & I started reminiscing about our last trip to Tokyo, which we both truly enjoyed. We love to travel and have been planning another vacation for quite some time now. Unfortunately, our conflicting work schedules make it difficult to settle on an agreeable date. And the more we reminisced, the more we realized that we’re in dire need of a nice relaxing vacation. The thought of going away to some exotic faraway land for some R&R got us so excited we ended up browsing through the Internet for hours, in search of possible travel destinations for our next vacation, perhaps holidays to Dubai since we've never been there. As we scoured through an endless array of great destinations and fantastic packages available here, we were pleasantly surprised at their very competitive rates. Besides providing essential planning information and great travel tips, Hotel Reservations.com also includes a comprehensive listing to the most suitable hotel, motel, condo or resort that accommodate every budget. Plus, it guarantees you the lowest Special Internet Rates online. So if you’re planning a vacation, look no further as I assure you that this is the only site you’ll need to visit! B was all smiles to be pictured with his idol, Shebby - a renowned football pundit for ESPN-Star Sports. 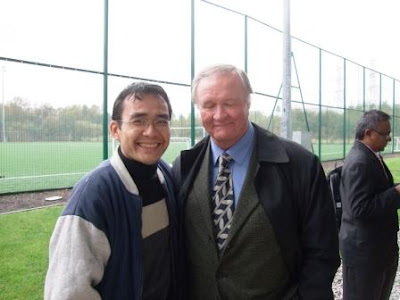 B with Ron Atkinson, former Man Utd manager at Man Utd’s training ground, Carrington. 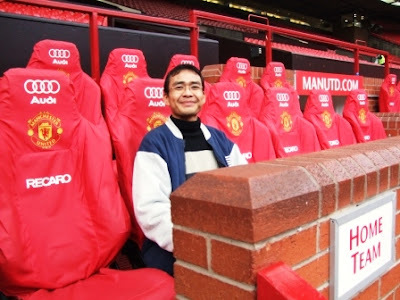 “So..this is how it feels..”, B sitting at the Man Utd dug out. Enjoying the live match between MU and Roma! 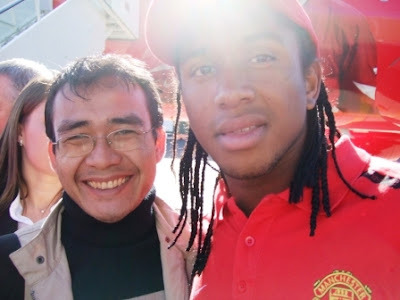 Smiling happily with Anderson, MU’s newly recruited Brazilian. B in MU's dressing room. 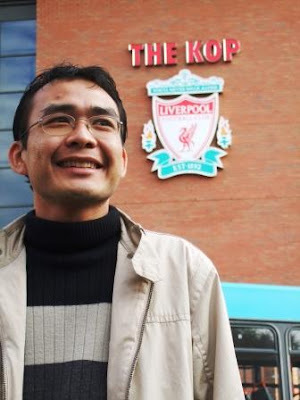 Standing proudly in front of Anfield Stadium, Liverpool. Hanging out with Bakar Atan from TV3. ARRRGGHHHHHh!! my eyes my eyes!!! All those MU pictures!! LOL!! PS. And yay!!! Thanks for being my first commenter GK! Wow, LIVE @ MU. I am an MU Fan but have not yet made a trip there yet. I am sure he had a wonderful time. What else could one ask for? Working and enjoying at the same time. Lucky B. Lucky you also. Have a Great Day Marz!! Marzie, the state of football in this country ain't never go improve no matter what they do la ... LOL! 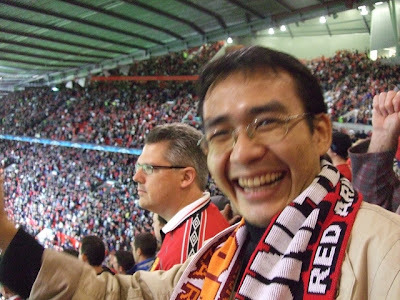 Oh, and those MU shot, gosh, what a blasphemous blog you run ... Liverpool supporter konon ... LOL! Boy o Boy! B looks so happy! And those pictures are really great! Glad B enjoyed himself! Say hi to B for me and best regards! Hope he'll get more opportunities to do coverage all over the world! Good job B! Hi Emila! Thanks, B was happy with his pics too, he took lots of them but these are his fave picks apparently! Oh Marzie, you simply cannot imagine the rivalry I have with my wife when it comes to sports. Not enough that she's an MU supporter while I'm a die hard Arsenal fan, she has to go and support Ferrari pulak while I'm into McLaren. So you can imagine how we are when these two teams face off ... it's like a mad house ... LOL! But all that said and done, I still hate Chelsea ... LOL! When are you going on your vacation? When I used to have a regular job, my vacation was staying at home...just a vacation from work! & to be with MU for quite some time. tht's so nice of u. You must miss him so much! Hi Raghav! 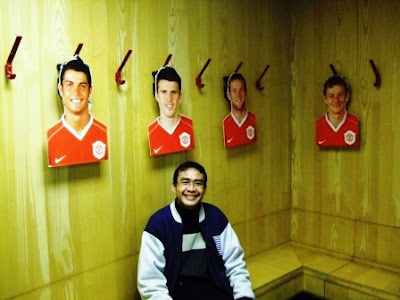 Oh yeah, B had a wonderful time indeed, savouring his football passion for one whole week! That hubby of yours sure gets to meet some great people. All smiles I see! These are some really good photos. anyway, about the widget bucks u implemented on your site. recently i heard some not very good news of it. all Non-US citizen clicks there wont be any payment made and google is actually banning widget bucks. wah, jealous-nya!!! omg, lucky im not MU fan! B was smiling so happily lar, & MU is def his LOVE (bside u of coz). Great pics, thanks for sharing! hehe! words from a jealous guy, next time take me along..will you? Anyway, nice pics you have there! I've never seen your hubby's pic until today. Hehehe Bestnya that trip. He sure looked like he had tons of fun! Really Rozella? He he, well meet my hubby, B! Oh he's off to another exciting trip soon, also football related. best lah b dah travel banyak tempat! He looked sooo deliriously happy in the picture.. I know I would too!! !